Looking forward to discovering your music! 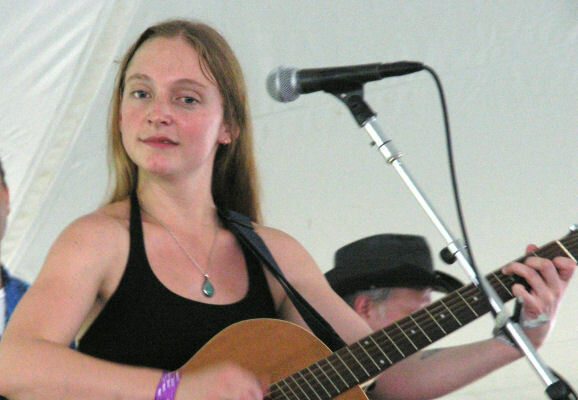 Saw Eilen Jewell at the Roots on the River festival, having never even heard of her before, and she blew us away. Light and breezy, but such a tight band, so at ease on stage, her voice laid back and easy even with the rhythm rocking along. I am just about wearing out the copy of Letters from Saints & Strangers that we bought at the festival, and I’m still finding it amazing to realize that she wrote most of these tracks. They all sound like classics that have been around for fifty years at least! I am not a fan of electric guitar, but her guitarist, Jerry Miller, plays electric guitar that has converted me! And the bass. I am a novice bass player, and this fellow, Johnny Sciascia, is so smooth, makes it look so easy. Almost makes me want to give up trying! And love those harmonies that drummer Jason Beek laid on. Hope to see this band again, soon! Eilen Jewell’s love of music began on a 1500-mile family road trip from Anchorage, Alaska to her hometown of Boise, Idaho. Bundling his wife, daughter, week-old son, and husky dog into the family Volvo, Eilen’s father (a tree farmer from a long line of Idahoans) put on a tape of Beethoven’s piano sonatas. Seven-year-old Eilen was so fascinated, she begged her parents to let her take piano lessons when they got back to Boise. At 14, Jewell dug her parents’ old records out of storage, a discovery that led her to pick up her first guitar. Her favorites, Bob Dylan’s Bringing It All Back Home and a Sun Records’ Howling Wolf album, led the quiet teenager to the music of Bessie Smith and Billie Holiday. I always knew you could believe everything you read.